Leaf blowers can be difficult to shop for. With a variety of brands and models to choose from, the average consumer may find it to be a lot of work to do the proper research. But for those people that just want a good blower at a good price, then look no further than the Greenworks 24012 7 Amp Single Speed Electric 160 MPH Blower . This blower has a simple design and is powerful enough to do most jobs around the house. Even if you have a larger yard to work with, this leaf blower is lightweight enough to allow you to carry it around for a long period of time without putting a strain on your body. It even has some environmental benefits to go along with the many benefits that it has for your day-to-day use. The Greenworks 24012 has a simple design and is powerful enough to do most jobs. The absolute best thing about this leaf blower is that it is lightweight, but it will still get the job done. The price tag of less than $50 is a pretty good positive as well. Unless you have an acre or more of land that you are working with, then you don’t really need any more power than the 160 mph air speed that this blower offers. With it being a corded electric blower, you don’t have to worry about filling it up with a messy gas/oil mixture before every use. The blower is also very quiet when compared to other blowers, especially the gas-powered versions. Many neighborhoods and cities have restrictions when it comes to the amount of noise products like this can make. This one is so quiet that you likely won’t have to worry about anyone complaining about the amount of noise that it makes. Some people don’t like corded electric blowers because you have to work with an extension cord that can be difficult to maneuver at times. That doesn’t have anything to do with this blower in particular, but it is still something to think about when buying your new blower. If you have a fairly large yard to work with, then you may not be able to get the job done quickly. The 160 mph wind speed is good for blowing dry leaves and debris into piles, but if you have a large surface area to cover, then it could take you a while. This Greenworks 24012 7 Amp Single Speed Electric 160 MPH Blower is one of the best values that you can get, whether you are looking at electric or gas-powered models. 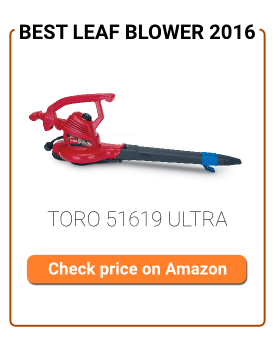 It is best suited for blowing off driveways, patios, flower beds or gathering leaves from your lawn. There’s no sense in spending a lot of money on a high-powered blower if you don’t need that much power. For light duties like the ones described above, you can expect to keep this blower in good working condition well past the warranty period. Electric blowers require very little maintenance, so you can just plug it in and go whenever you need to. One of the best features is that it is good for the environment, so you won’t have to worry about sending harmful toxins into the air during each use. Not only will the environment appreciate it, but your neighbors will too! 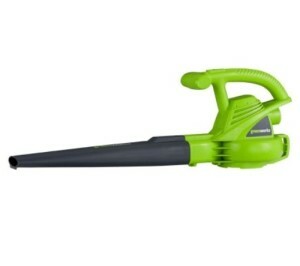 Any homeowner with a small-to-medium size yard deserves to have this leaf blower in their collection of lawn equipment! Greenworks leaf blowers are built to last and to be healthy for the environment. They take pride in the fact that none of their products ever release any emissions into the air. Greenworks is committed to giving consumers a quality product at a low price. They know that yard work can be tough, but Greenworks strives to make it as easy as possible so that you can spend your time doing the things that you really enjoy doing. They also offer a 4-year warranty, which is twice as long as the industry standard.